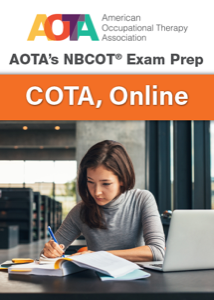 AOTA’s new online NBCOT® Exam Prep program is the most comprehensive and effective way for OTAs to get ready for the biggest test of their career—at their own pace, any time and any place. Developed and reviewed by top occupational therapy leaders and educators across all practice areas, this prep includes more than 1,000 self-assessment questions and vital tools that will help students and new graduates focus on the topics they’ll need to master. Subscriptions include access for 1 year from the date of purchase. The question banks in AOTA’s NBCOT Exam Prep are designed specifically for the OTR® and COTA® tests and with the roles of the OTR and COTA in mind. Users should purchase the product that corresponds with the test they plan to take in order to avoid gaps in their preparation. Note: Customers who want to subscribe to both COTA and OTR Exam Prep, as well as existing Exam Prep customers who want to purchase additional OTR or COTA subscriptions, must contact customer service first. Exam Prep and other AOTA digital products are nonreturnable. · Create practice tests of any size around specific topics. Question bank includes standard 4-option multiple-choice questions and questions using NBCOT's new 6-option format. · Get detailed feedback about your answers. · Check your progress by NBCOT® domain and by topic. · Compare your progress with other users. · Supplemental content includes topic outlines and test-taking hints. AOTA’s NBCOT Exam Prep is not affiliated with or endorsed by The National Board for Certification in Occupational Therapy, NBCOT®. NBCOT® is a registered trademark owned by The National Board for Certification in Occupational Therapy.